Igor Bensen, the son of Alexandra and Basil M. Benzin (Vasilii Mitofanovich Benzin), was born 1 April, 1917 in Rostov, Russia. Igor’s father worked within the Russian Agricultural Department and was assigned a sector in Czeckoslovakia (1921-1930). Russia was soon to find itself in very turbulent times as the Russian Revolution was approaching. Bensen’s father was not supportive of the war and managed to get his family relocated to Prague which would prove to be a much safer area than the heart of Russia. Around 1934, at the age of 17, Bensen was sent to Belgium earning his Bachelors of Science Degree. Igor followed his schooling by being accepted under a scholarship to The Stevens Institute in the United States. Bensen did well through his studies earning a degree in mechanical engineering with honors in 1940. Bensen had even been offered a position to work with Sikorsky but was not able to secure the position due to his alien citizenship. Bensen was however able to secure work at General Electric and at the age of 23 he would enter a road of passion for rotorcraft that hadn’t been seen since the passing of it’s ambassador, Harold Pitcairn. General Electric put Bensen’s interest in rotorcraft to task and assigned him to a project using a Kellet XR-3. Bensen had managed to also secure his position as pilot of the XR-3. As the project moved along, Bensen’s skill at piloting autogiros increased. The Army Air Force had among its inventory a collection of gyrokites to include the small Hafner Rotochute and Fa-330. Bensen approached his supervisor for research study of the Rotachute. The Army agreed to allow the research and loaned the craft to General Electric. Naturally the military wanted a military pilot flying the gyro but Bensen was able to move past the red tape and actually flew the Rotachute as it was launched from the bomb rack of the XR-3. Bensen was now firmly smitten with a passion for rotary-wing aircraft and began designing and building his first gyro-glider. Bensen built a 120-pound glider called the B-1. The B-1 was Bensen’s attempt to simplify the articulated rotor of the Rotachute into a semi-rigid design and incorporate an overhead control stick reverser for better control of the rotor. Bensen continued his work with gyro-gliders and developed the B-2 a ship of all metal construction throughout. The close of the 1940’s ended a lot of research in older technologies not just in terms of autogiros but that of propeller driven aircraft as well. As the United States and the world was about to enter the 1950’s, technologies seized from Nazi Germany would find more refinement and advancement to not only usher in the “Nuclear Age” but the birth of commercial jet service and the birth of the commercial helicopter industry. Bensen having a good foundation in rotary-wing aircraft was soon to be a sought after individual. In 1951 Igor leaves General Electric and accepts employment with Kaman Aircraft. Bensen stays on with Kaman for a couple years when in 1953 he leaves Kaman to start his own company The Bensen Aircraft Corporation.Igor establishes his company in Raleigh, North Carolina on a loan from his brother. In the same year, Bensen develops the B-6 “Gyro-Glider” and begins selling plans in 1954. Bensen, realizing people were seeking a sport aircraft from readily available materials turned out many of his initial aircraft from supplies at the local hardware store. The B-6 was a tubular frame structure, equipped with skid tubes and two, small, rear wheels and a nose wheel, dual rudders and an overhead control arm. The glider was towed by an automobile to get airborne. From the data gained from his experience with the B-6 Bensen refines the glider into a new model called the B-7. The B-7 was first introduced in 1955 and like its predecessor was a towed glider. Once airborne the cable could be released and, dependant on winds, the free flight could last several minutes. This was rather quickly followed by the B-7M (M for motorized) which was the first sport class gyroplane with an engine. Powered by a Nelson H-59 engine, the new gyroplane was met with much enthusiasm. Builders could now be able to build and train in the basic B-7 and following with enough practice to become proficient with the “Gyro-Glider” later add the modifications for the engine package and own and fly a fully powered sport gyroplane. This was a great concept and orders continued to come into the company for plans. Bensen soon found from some of the builders the difficulty they had with working with round tubing, so Igor went to work again on a new model. The new model would use 2x2 square extruded material instead of the round tubing. What Bensen didn’t realize till later is that he had just developed the most popular and widely manufactured gyroplane in history, with his Bensen B-8 series of gyroplanes. The B-8 was the basic “Gyro-Glider” and was to fill the role of the B-7 with much improved ease of construction. The B-8M was introduced in the same year and became a smashing success. The B-8M has been the most successful gyroplane in history. In the closing years of the 1950’s Igor’s company was doing well and he continued to research and develop his designs such as the B-8M/a (for agriculture) a “Gyro-Copter” that was rigged to perform agricultural spraying operations. Other improvements included optional engines, a jump take-off option and later the introduction of a builders kit. 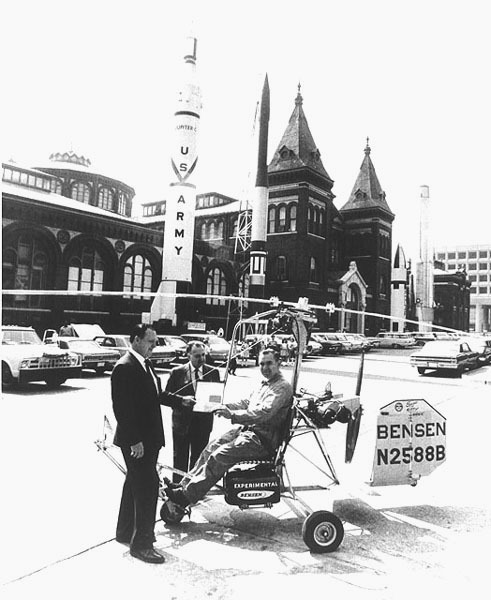 The Bensen Aircraft Corporation was the first gyroplane manufacturer to offer their aircraft in kit form and among one of the first to do so in all forms of Sport Aviation. Bensen was quite naturally among one of the founding pioneers, not just in regards to gyroplanes but in sport aviation as well, for homebuilt aircraft and kit manufacturing. Igor was a member of the Experimental Aircraft Association, which at the time was the fledgling organization for sport class aviation homebuilders in the United States. Photo provided by Jared and www.roweaviation.com. All rights reserved. Bensen’s trade-named “Gyro-Copters” continued to be popular among the homebuilt aviation community. Bensen and his company continued to refine their design of the classic B-8M to the point that so many modifications had been done that he redesignated the modified gyroplane as the B-11. Some other unique aircraft from Bensen include the B-16, a twin engine, four-bladed, two-seat gyroplane. The B-8Ma “Agri-Copter”, which was a B-8M set up for agricultural spraying. The “Hydro-Copter” which was the B-8M on floats. The “Prop-Copter” which was a flying platform. Bensen even designed a coaxial rotor helicopter called the “Lil’ Zipster”. All of which Bensen himself had flown. Igor even attempted and did successfully fly a boat- he called it the “Heli-Boat”. Of all the different gyrocopters built by Igor Bensen none is more famous than the “Spirit of Kittyhawk” which set multiple world and national gyroplane speed, altitude and distance records, a total of twelve in all. The setting of these records took place between May of 1967 and June of 1968. Bensen was always a man that stood beside his product and to better support his product and the gyroplane builders of his kits; Bensen established the Popular Rotorcraft Association. Over time, the PRA would become the predominant association for all homebuilt rotary-wing aircraft of all types and brands. As if breaking records, establishing and heading a new organization, running a company, Bensen soon found his hands involved in a government project known as DDV or Discretionary Descent Vehicle. The program was conducted by the U.S. Air Force with a basic B-8, and designated the X-25. To collect additional data two additional aircraft evolved the X-25A and X-25B which were modified B-8m’s. The first flight of the X-25A was flown in 1968. As stated earlier, many design modifications were done to the basic B-8M and a lot of these occurred throughout the later part of the 60’s. One gyroplane aficionado by the name of Ken Brock had so highly modified the basic design of his Bensen that in 1970 Bensen told Brock it could no longer be called a “Bensen Gyro-Copter”, Ken then called his ship the KB-2 gyroplane. Like Ken Brock there were others to develop derivatives of Bensen’s basic design. For twenty-five years plus the Bensen Aircraft Corporation sold plans, kits and provided services to builders of their products. But, as the Eighties were approaching the Bensen Corporation did not introduce any new designs and this may have been the undoing of a good company. Video provided by T. Chick. The Reagan Years as we so affectionately call the eighties, was a massive time of change not just in America but around the world as well. Events from Haiti, Panama, The Falkland Islands, the fall of The Berlin Wall and Tianimin Square, and the Russian invasion of Afghanistan all told the world that change was at hand. The homebuilders of the EAA had managed to put on an annual event that was now the world’s largest airshow at Oshkosh Wisconsin and is now called Air Venture. Bensen and Brock would be there selling kits, plans and parts and offering builder advise but a new kid was about to enter the block from Canada. A Canadian company by the name of Rotary Air Force introduced (initially) a single place, fully enclosed fiberglass cabin gyroplane called the RAF1000. Very soon, however; RAF found there was demand for a two-place ship and the RAF 2000 line was formed. The RAF was a quality kit with CNC machined parts and many features and options. RAF sales started to soar and the open frame sales started falling. In the United States gyroplane manufacturer Air Command was having its' own success selling both single and dual seat aircraft kits. It appears the combined success of Air Command and RAF was the indication that the market was shifting and the Bensen Corporation was not able to keep pace with these newer dual place aircraft. The domanant grip the Bensen Corporation had in gyroplane kit sales was slipping. As 1987 came and went the Bensen Aircraft Corporation was really in dire straights and in 1988 the decision to close operations was finalized. The company that re-introduced the gyroplane to the world was no more. Others would follow Rotary Air Force and Air Command's lead and a whole new generation of gyroplane designs would carry sport gyroplane aviation into the new century much to the foundation laid by Bensen and his little open frame design inspired from the Hafner Rotachute. Dec 6, 1955 B-7M, the first Bensen powered “Gyro-Copter” using a Nelson H-59 engine. - B8, structure material change of the B-7 design, incorporating 2x2 square stock in place of round stock. July 8, 1957- B8M, powered gyrocopter using a McCulloch target drone engine of 72 hp or optional 90 hp and also optional jump take off. B8Ma, “Agricopter”, a B-8M rigged for agricultural spraying. B-11, “Super Bug”, the continued modifications of the B-8M lead to new designation. B-16, a twin engine, two-place, four bladed gyrocopter. 1968- X-25A, Bensen modified “Gyro-Copter” a.k.a. Discretionary Descent Vehicle (DDV). Dr. Igor Bensen, in all his life achievements toward the advancement of rotary –wing aviation, has to be considered among aviation’s greats. A man who single handedly brought the autogiro back to life in a new form when it could have easily slipped into the same fate of the zeppelins, from the same period of history. The founding father of sport gyroplane aviation, an engineer, builder, pilot, company founder, founder and initial President of the PRA. Bensen’s designs not only inspired others to his passion with gyroplanes but for others to advance the design and sport. From his initial designs would spur the development of Ken Brock's KB-2, “The Sportster” and “Bumblebee” by Martin Holoman and not to be left out, Bill Parsons with the “Parsons Trainer”. Bensen's designs also became the initial focus of interest for such people as Jay Carter Jr., David and Jay Groen and a plethora of others. A true American inspiration of the “American Dream” and way of life, where an individual can be as creative and successful as his/her dreams and ambition will carry them. The Bensen Aircraft Corporation was established to provide safe, cheap and easy-to-build rotorcraft to the private individual. The company certainly did just that for thirty years and in the process became the most popular kit aircraft of its time, selling more than even its fixed wing counterparts. It is in humble commemoration that the leadership and inspiration of Igor Bensen will be remembered and continue to inspire others to the passion of gyroplanes. 1917 – Born, Rostov Russia. 1934- Begins B.S. Degree in Belgium at age 17. 1940- Receives mechanical engineering degree from Stevens Institute. 1944- Engineer and pilot for rotary-wing R&D at General Electric. 1946- Introduced to and researched the Fa-330 and Hafner Rotachute. Nov, 1946- G-E Gyro-Glider developed. 1951- Accepts employment with Kaman Aircraft. 1953- Leaves Kaman to found Bensen Aircraft Corporation in Raleigh, North Carolina and creates the B-6 “Gyro-Glider”. 1954- Bensen begins selling plans for the B-6. 1955- Bensen introduces the Bensen B-7 “Gyro-Glider”. Dec 6, 1955- Bensen introduces the B-7M, his first powered “Gyro-Copter”. (1957)- B-8 “Gyro-Glider” introduced with square tube frame. 1962- Dr. Bensen creates the Popular Rotorcraft Association. May-June, 1968- “Spirit of Kittyhawk” sets 12 speed, distance and altitude records (both national and World). 1968- X-25A makes first flight in May as a proof-of-concept vehicle in the DDV Program. 1968- Receives Doctorate of Divinity from Indiana University. 1969- “Spirit of Kittyhawk” inducted into the Smithsonian Air and Space Museum collection. 1962-1971 President of the Popular Rotorcraft Association (PRA). 1988- Bensen Aircraft Company Closes. 2000- February, Dr. Bensen passes away from Parkinson’s Disease at the age of 82. Special Thanks to Jared and www.roweaviation.com for the use of the photograph of Dr. Bensen. Special Thanks to T. Chick for the use of the great Bensen gyrocopter demonstration video.